The Karen National Union’s army released a statement voicing its frustration and disappointment in national peace talks with Burma’s government and its military. The KNLA accused the government of using road building as a strategy to complete its attempts to militarize Karen held territory. 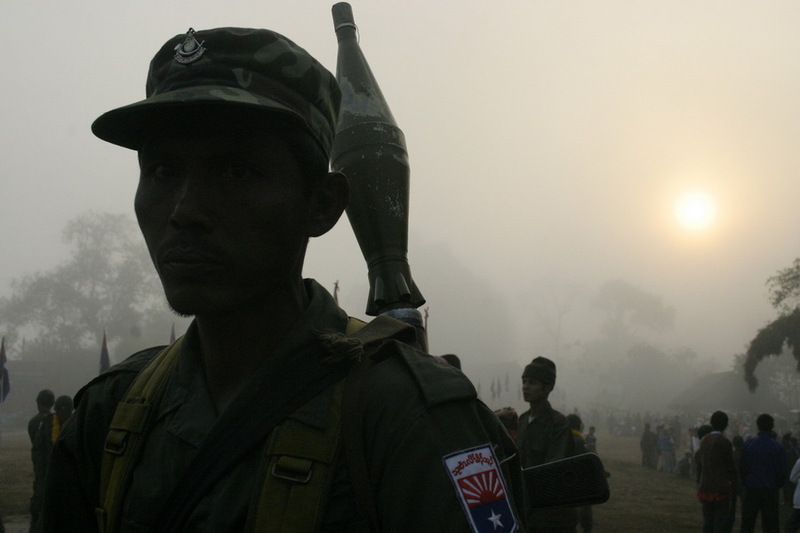 The KNLA warned if the Burma Army continues its attacks and attempts to militarize its territory it will fight back. The Karen National Liberation Army pointed out in its statement that the national peace talks had failed to deliver any tangible outcomes for Karen people. The KNU was one of eight ethnic armed groups to sign the U Thein Sein Government’s Nationwide Ceasefire Agreement (NCA) in October 2015. The NCA signing was attended by the international community, including the US, who released statement lauding former President U Thein Sein and his government. Despite the signing of the agreement the KNLA accuse the government’s armed forces of consistently breaking the ceasefire. The KNLA point to ongoing fighting with the Burma Army, that started in Mutraw (Hpapun) District in March, and have displaced thousands of Karen villagers. The KNLA statement said civilians are deliberately targeted by the Burma Army.